In 2016 Studio 22 Dance Academy will be presenting its annual performance at the Franklin Area High School on May 18th and 19th. Every year a hundred students and instructors work to show off the fruits of eight months of hard work. From the cutest three year olds to the multi-talented eighteen year olds, each year is a labor of love for all involved. Along with the standard technique classes, the show is also a vehicle for the studio’s competition team. The team is comprised of a small group of dancers who have auditioned for the honor of representing the studio at regional events. This year, the team is especially proud to present one particular number. For years Julie Martin, a former student and instructor at Studio 22, has been talking about a pet project of hers, a true dream project. This year, the team worked to bring that project to light. At a recent competition, the number took a top honor for the weekend out of hundreds of numbers competing – The Ultimate Emotional Experience award. “It’s like a dream come true, to blend my two passions.” Martin said after hearing of the honor. The story is of a young lady following her own funeral procession and seeing the impact of her passing. Hannah Young portrays Martin in the piece, the funeral director, the leader of the service. Senior Erica Perry is the lost young woman, watching her friends mourn her as she tries to show them that she is still with them. The mourners also portray the pallbearers, solemn but hurting; these roles are played by Skylar Shields, Justus Lind, and senior Sara Huey. There is an extra element of emotion as the two seniors have a meaningful moment, coming together before parting for the last time. 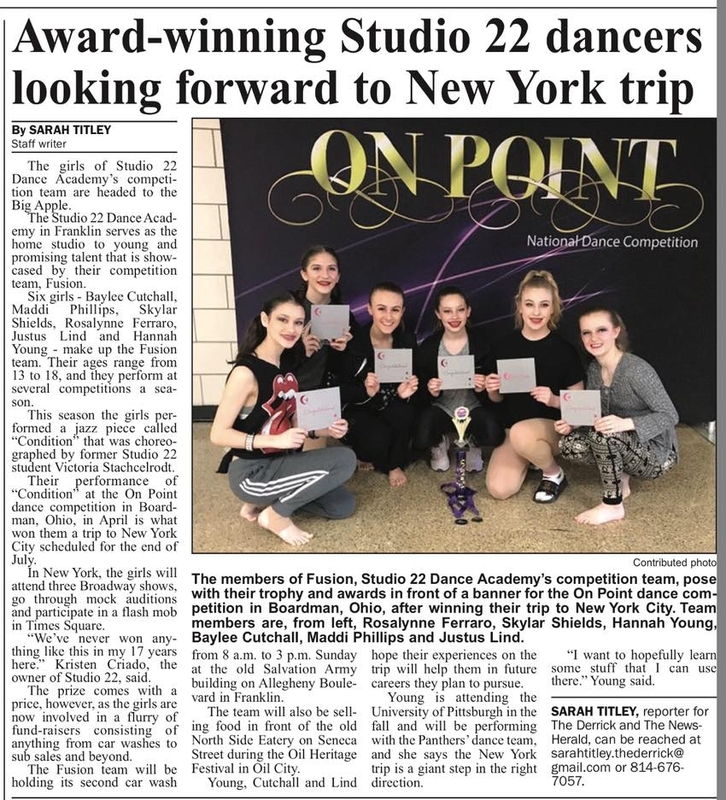 Other award winning competition numbers will be performed as well as the regular Studio 22 classes featuring Ballet, Tap, Jazz, Modern, Hip-Hop, and Pointe numbers. Students work half the year learning the techniques and disciplines needed and then the last half of the year applying that technique to their numbers. All of their hard work culminates in two hours of pure joy. Studio 22 presents “Tsunami” at the Franklin Area High School, May 18th and 19th at 7:00pmTickets available at the door - $10 for adults and $5 for children 12 and under.